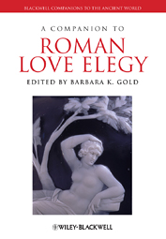 A Companion to Roman Love Elegy is the first comprehensive work dedicated solely to the study of love elegy. The genre is explored through original essays that offer new and innovative approaches to specific elegists and the discipline as a whole. Contributors represent a range of established names and younger scholars, all of whom are respected experts in their fields. Contains original, never before published essays, which are both accessible to a wide audience and offer a new approach to the love elegists and their work. Includes essays on the Roman elegists Catullus, Tibullus, Propertius, Sulpicia, and Ovid, as well as their Greek and Roman predecessors and later writers who were influenced by their work. Recent years have seen an explosion of interest in Roman elegy from scholars who have used a variety of critical approaches to open up new avenues of understanding.